Oh boy, where to begin with this one? 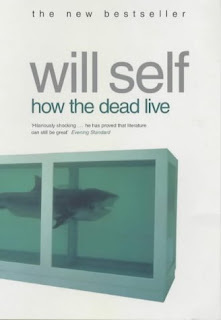 Will Self is one of those authors that I've known about for a long time, but had little actual information on his work. I'd seen him a few times on the rare occasion that I watch TV nowadays, but that was about as far as my knowledge went. So when I saw How the Dead Live on sale, I figured that there was little harm in trying it out. Now that I've actually read it, I'm not sure how much more I know about him. How the Dead Live follows the late life and afterlife of the narrator Lily Bloom, a generally cantankerous and unpleasant old woman. In life, the reader sees her deal with her two daughters: Charlie, the elder daughter who is pretty much a non-entity amalgamation of everything that is socially acceptable, and Natasha, a needy and manipulative junky. In death, she has to contend with a calcified foetus obsessed with pop songs from the 70s, three manifestations of all the fat that she's lost, gained and regained through years of dieting and the angry soul of her long dead son. From that description, it sounds pretty damn interesting. And at times it is. But for the most part, it just left me confused. Not confused in a plot sense: in that respect it's pretty straightforward. It left me confused as to how I'm meant to feel about all of this. For instance, the spirits that Lily has to exist with make it sound as if the afterlife is some incredibly strange Twilight Zone type of place; it's really not. All the afterlife is in this is normal life, except you don't need to breathe, eat or sleep. After a while she even begins to ignore or forget the weird manifestations around her. Considering she's the narrator, that means that the reader begins to forget them too, which I don't think should be the case; they're what interested me on the blurb, so for them to be forgotten so easily is really disappointing. Although I suppose that that may be the whole point: have an afterlife that is exactly the same as life, and you minimise the fear and reverence surrounding it. I guess my main problem with this book is that at times it seems clever and witty, but there's always an underlying current of irritation at the very cleverness that typifies the novel's tone; much like my opinion of what I've seen of Will Self, now that I think about it. I think the only thing that I really genuinely enjoyed was the ludicrous nature of some of the deaths. Take Lily, for example. She is diagnosed with terminal breast cancer at the beginning of the book. After a few chapters, it spreads to the brain, thus making her demise imminent. It's when the cancer hits her brain that it gets funny; she begins to rave and lose control of her actions, thoroughly freaking out everyone around her. That doesn't sound all that funny, but if you have even a passing knowledge of cancer symptoms, it's pretty damn obvious that this is not how cancer works. Generally, when you've got a brain tumour, you get some headaches and then you die; quick and relatively quietly, not gibbering like a loon. That was pretty much the only thing that I liked without reserve, simply for the ridiculousness of it. Otherwise, I'm still not sure what to make of this. I don't dislike it, but then I don't particularly care for it either. I feel like it provoked something for me mentally, but I couldn't tell you for the life of me what that thing could be. I guess all I can say is that I feel uneasy because of this lack of knowing. Maybe that was the point all along.